Retinal detachment is where the retina, the layer of light-sensitive tissue at the back of the eye detaches or pulls away from the underlying layer of blood vessels. Correct the underlying cause; there are various surgical options to re-attach the retina to the back of the eye. The retina is the thin, transparent layer of light-sensitive tissue which lines the rear (posterior) wall of the eye, working similarly to that of the film in a camera. Photosensitive cells known as rods and cones convert light into electrical impulses and transport them to the brain via the optic nerve. Retinal detachment (RD) is a common, severe and sight-threatening disorder which occurs when the retina is lifted or pulled away from the underlying retinal pigment epithelium due to a tear in the retina which allows vitreous, a gel-like substance which gives the eye its shape to leak through the tear which causes the retina to separate from the underlying tissue. The vitreous humour is a gel-like substance which fills the interior of the eye helping it keep its shape. The retina has nine neurosensory layers including rods and cones (responsible for vision) which are located in the innermost layer and the retinal pigment epithelium (RPE) behind the photosensitive layer. In the centre of the retina is the optic nerve, which travels from the retina to the brain where it transmits visual information. The choroid is a layer of tissue behind the retina which is rich in blood vessels to the retina with oxygen and nutrients. Rhegmatogenous retinal detachment (RRD) occurs when there is a tear in the retina which leads to vitreous humour seeping through the tear and behind the retina, separating it from the underlying retinal pigment epithelium. Exudative (serous) retinal detachment is due to a build-up of fluid between the photosensitive layer and the retinal pigment epithelium. The most common causes of exudative retinal detachment are inflammatory conditions. Traction retinal detachment occurs when the retina is pulled off the retinal pigment epithelium due to tractional forces. The most common cause of traction retinal detachment is diabetes. 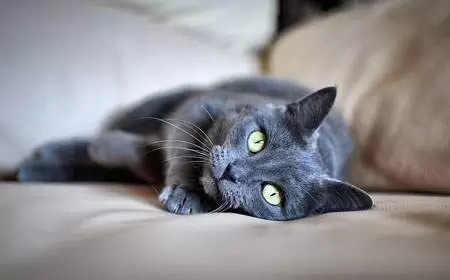 There are no breed predilections, it is seen more in older cats, but that is no doubt due to the increased incidence of systemic diseases such as hypertension and hyperthyroidism which occur as cats age. Hypertension (high blood pressure): One of the most common causes of retinal detachment in cats. High blood pressure causes fluid to leak from the blood vessels behind the retina which over time causes it to separate from the underlying layer it is attached to (serous retinal detachment). Hypertension may be primary or secondary (see below). Common causes of hypertension include hyperthyroidism (benign tumour of the thyroid gland) and kidney disease. Hyperviscosity syndrome (HVS): This condition causes the blood to become thicker than usual due to increased proteins (hyperproteinemia), most often associated with multiple myeloma. This can lead to ruptures in the small blood vessels behind the retina. Advanced diabetes: Uncontrolled blood sugar levels can damage the tiny capillaries in the retina, the body compensates by growing new but abnormal blood vessels (neovascularisation). These blood vessels are more prone to leaking blood into the vitreous humour (the gel-like substance inside the eye). Scar tissue can form which at times can contract and pull the retina away from the underlying retinal pigment epithelium. This condition is called diabetic retinopathy. Trauma: Blunt force, penetrating injury or surgical trauma. Infection: Bacterial, fungal, protozoal or viral infection. Cancers: Lymphoma, multiple myeloma (cancer of the plasma cells), tumours of the eye (most commonly melanoma or ciliary body adenocarcinoma) and any primary cancer which has metastasised. Exposure to toxins or certain medications: Griseofulvin, ethylene glycol/antifreeze, rodenticide. Glaucoma (increase in intraocular pressure within the eye): Caused by stretching of the retina as the eyeball increases in size. Congenital (present at birth): Abnormalities of the eye or retina. Systemic lupus erythematosus (SLE): An autoimmune disorder which can affect any organ in the cat, including the eyes. Retinal detachment isn’t painful to your cat, and it is quite easy for the condition to go unnoticed. It may occur in one (unilateral) or both eyes (bilateral). When both eyes are affected, it is generally due to an underlying systemic disease. Sudden blindness or reduced vision. You may notice your cat becoming more clumsy. Pupils may be slow to dilate, with total retinal detachment the pupils will remain dilated. In some cases, bleeding in the front of the eye may visible. Your veterinarian will perform a complete physical examination of your cat including a thorough ocular examination. He will obtain a medical history from you including other symptoms you may have noticed, known medical disorders, the age of your cat, any medications he may be taking or exposure to toxins. Baseline tests: Biochemical profile, complete blood count, and urinalysis to evaluate the organs and look for signs of infection, poisoning or inflammation. Ophthalmoscopy: An examination of the back part of your cat’s eye, tonometry to measure pressure within the eye. Blood pressure check: This is performed in a similar way to humans, with an inflatable cuff placed on the cat’s front leg or tail. T3 and T4 tests: Blood tests to check levels of T3 and T4 thyroid hormones in the blood to evaluate for hyperthyroidism. Imaging: Radiographs and/or ultrasound of the chest and abdomen. Bone marrow biopsy: If your veterinarian suspects multiple myeloma. This would reveal an overabundance of plasma cells. The goal of treatment is to address the underlying issue and where possible, repair the retina. Your veterinarian will refer you to a specialist eye veterinarian (ophthalmologist) to perform retinal surgery. Cryopexy is a procedure in which the ophthalmologist uses extreme cold to freeze the retina around the tear. This causes the area to swell and forms scar tissue when it heals. It is this scar tissue that seals the retina to the wall of the eye. Scleral buckle surgery: The surgeon places a piece of silicone to the sclera (the white portion of the eye) to push the sclera towards the break or tear in the retina, the fluid is drained, and the tear is frozen during this process. Pneumatic retinopexy: The surgeon injects an air or gas bubble into the centre of your eye, to push the retina back in place. The tear is sealed with laser or cryosurgery. Vitrectomy: The vitreous is removed from the eye and replaced with a gas bubble which pushes the retina back in place against the wall of the eye keeps allowing it to heal. The tear is then repaired by cryosurgery or laser. High blood pressure: Where possible, treat the underlying cause and medications to control high blood pressure. Hyperthyroidism: Surgery to remove the thyroid gland, radioactive iodine treatment to destroy the tumour or prescription diet which is limited in iodine which is necessary for the production of thyroid hormones. Kidney disease: Prescription diet, phosphorus binders, and erythropoietin, a hormone which stimulates red blood cell production. Diabetes: Dietary modification and where necessary, insulin injections. 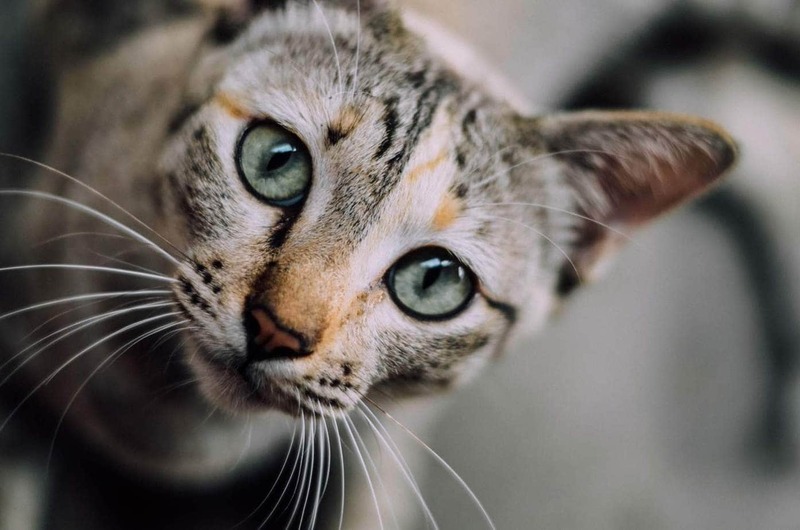 Close monitoring of the cat’s blood sugar levels are crucial in the diabetic cat as many serious complications can occur as a result of increased blood sugar levels. Trauma: Surgery to repair the injury. Tumour: Surgery and/or chemotherapy for cats diagnosed with a tumour. Chemotherapy may be a stand-alone treatment to slow down progress of an inoperable tumour. Multiple myeloma: Radiation therapy or chemotherapy to treat multiple myeloma along with supportive care along with analgesics to relieve pain. Infection: Antibiotics, antivirals or antifungals and supportive care such as fluids and nutritional support. Vasculitis: Corticosteroids to reduce inflammation. SLE: NSAIDS, limit sunlight exposure, and antibiotics to treat a secondary infection. Glaucoma: Medications to bring down intraocular pressure, medications to relieve pain, steroids if inflammation is the cause and in some cases cryosurgery to freeze a portion of the ciliary body to reduce production of aqueous humour. Poisoning: Gastric decontamination such as induce vomiting and administer activated charcoal for a cat who has ingested poison. Administration of ethanol for cats who have ingested antifreeze, or vitamin K for cats who have rodenticide poisoning. Sodium bicarbonate to correct acid imbalances along with supportive care. The prognosis can vary depending on the speed of treatment and the underlying cause. The prognosis is poor if the retina has been detached for more than 24 hours, in which case it may be necessary to remove the eye (enunciation). This is an unfortunate outcome; however, cats can adapt very well to the loss of their sight. Keep your cat indoors and restrict activity during recovery. Regular follow-ups to monitor your cat’s progress and blood pressure. Restrict activity until the retina has re-attached.